The tech sector is the country's third largest export earner behind dairying and tourism - and I know which sector I'd rather my kids got interested in. Neither dairying or tourism pay particularly well. Both are well below the OECD wage average metric that Sir Paul Callaghan used to wave around in front of politicians' noses. Yet ICT and the wider tech sector pays far more than the average. If we want a successful economy we need more of this, not less. The companies that make up the top 200 tech sector companies now employ more than 43,000 people and pay on average $84,000 per year. Federated Farmers estimates the average New Zealand dairy farmer earns between $67,000 and $71,000 per year although MBIE suggests that's a tad high, and puts the figure at between $46,000 and $53,000. There are roughly the same number of dairy farmers as IT and tech employees in New Zealand - I'll let you do the maths as to which makes more sense from an employment point of view. The report also makes it clear that there really is a crisis of understanding among our investment community as to the value of New Zealand tech companies. After a few disastrous listings on the stock market, and a notable number of companies failing to even get to that point, most privately owned New Zealand tech companies seek investment outside the stock market and away from the public. Private equity is eager to buy our companies and typically that involves the companies being swallowed whole, closing down or moving offshore. Rarely does that investment benefit New Zealand as a whole and this is a crying shame and something that should be addressed in the very near future. We've already lost a lot of talent and IP this way - we should be nurturing early companies not sending them on their way. But for now we should raise a toast to the tech sector. Finally we are developing that second string to our economy and one that doesn't rely on fertiliser, rich tourists giving us generous tips or getting up at 3am to move the animals about. Long may it continue. Yes, just when you thought we'd sorted this out for a goodly length of time and we could all get on, the copyright owners are at it again. The copyright law is outdated, you see, and needs to be overhauled because OMG we've done a survey and some company reckons we're losing $50 million a year to piracy. No wait, it might be $100 million a year. Either way, it's high time legislation caught up and we want to see ISPs held liable and forced to block websites. Yes, if this all sounds familiar it's because it is. Last time round we ended up with the three strikes law which was roundly cheered by the copyright folk until they figured out the government wanted them to pay (gasp) $35 to the ISP involved to send a letter to the pirate they'd identified. 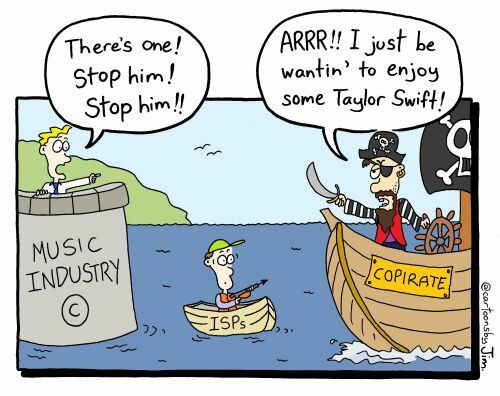 The music industry did this for a bit and there were several cases brought before the Copyright Tribunal. The movies and TV industry did not do this at all because nothing says you've got the courage of your convictions like not protecting your $100 million movie budget with a $35 legal challenge. But the industry didn't want to set any kind of precedent because of course in other jurisdictions - those without the fee - the industry sends out a blizzard of notices demanding ISPs take action, and if those ISPs don't act immediately, they get sued to within an inch of their balance sheets. So having won the war but lost the battle, the copyright holders now want new legislation to tackle this burgeoning threat, despite there being a clear solution: make your content available legally at a reasonable price. It's long been my belief that privacy will be the next big issue we have to face as a society. You know, once we discount fake news, climate change, re-militarisation and so forth. I know this to be true because I watched it on an episode of The West Wing and they wouldn't be allowed to run just any old thing on TV now would they? Privacy is important because once it's gone, there's no getting it back. I say this as someone who watched a successful attempt to recall an email that had gone out containing sensitive information recently - while you might get lucky you're more than likely to be unable to stuff the genie back into that particular bottle. Now, following yet more revelations about "oops" and "whoopsie" and "meh we didn't think you'd mind" we have none other than Tim Cook standing up at the pulpit to deliver a blistering speech on the need for better privacy laws. He was talking about the US but it applies equally to New Zealand and indeed to most of the planet. As we move to storing information about ourselves everywhere we need to have some kind of controls that can be applied right around the world. Cook is calling for regulation at a federal level. That's quite a turn around from last year when most tech companies were rallying to the "we can self-regulate" flag, but it's understandable why Cook has gone that far. The US has become a home to some very unpleasant abuses of private data and between Cambridge Analytica and Facebook, and the number of breaches, leaks and security flaws revealing hundreds of millions of accounts to the world, it's now time for the big boys in the Senate and Congress to step up. He'd like to see the EU's GDPR used as a template and certainly that's been the push locally as well. Whatever comes of it in the US, it's a wakeup call to New Zealand legal beagles. We need better protections, we need mandatory reporting and we need to act now, before the genie is completely out of the bottle.